Stephanie Smith, 35, has a little son named Isaiah. When the little guy is born, she couldn’t be happier. When she sees something stranger on her newborn’s skin, the tiny baby’s life transforms into a nightmare. 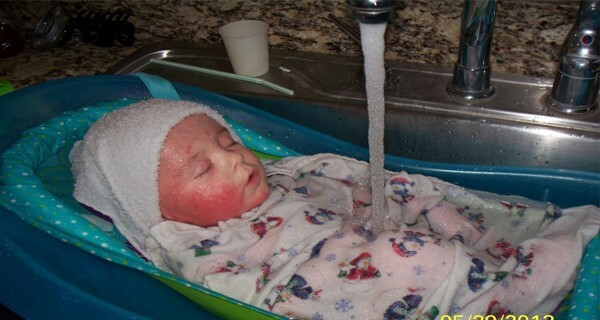 A red rash breaks out on Isaiah’s skin as he is just 3 months old. Every time when he is exposed to perfume or other intense odors, the rash becomes worse. It gets so bad that Isaiah’s skin ruptures and begins to bleed and discharge. The rash recedes slightly but then returns even worse. The doctors cannot the reaction. His hair begins to fall out and he is hardly responsive. In the throes of desperation as the doctors said they couldn’t help her son, they turned to the internet. On a forum she found a post about “Steroid withdrawal” and sees pictures of children with the same problems. Suddenly she realizes what Isaiah’s problem is. Stephanie tells, as only she can, what happened to her son. She did so because her story could possibly help other mothers whose children are also suffering from the same problem. That is why it is important to SHARE this story with others. Maybe it can help another child and a desperate mother.